Interstate 279 originates at the Fort Pitt Bridge east end by the Point in Downtown Pittsburgh. The freeway forms part of a route looping east from Interstate 79 near Carnegie and north to Franklin Park in the Pittsburgh suburbs. I-279 spans the Allegheny River across the Fort Duquesne Bridge to join Parkway North by Heinz Field (home of the Pittsburgh Steelers NFL franchise) and PNC Park (home of the Pittsburgh Pirates MLB franchise) along the North Shore. Parkway North veers northward at East Allegheny and continues past Bellevue and Westview before rejoining Interstate 79. 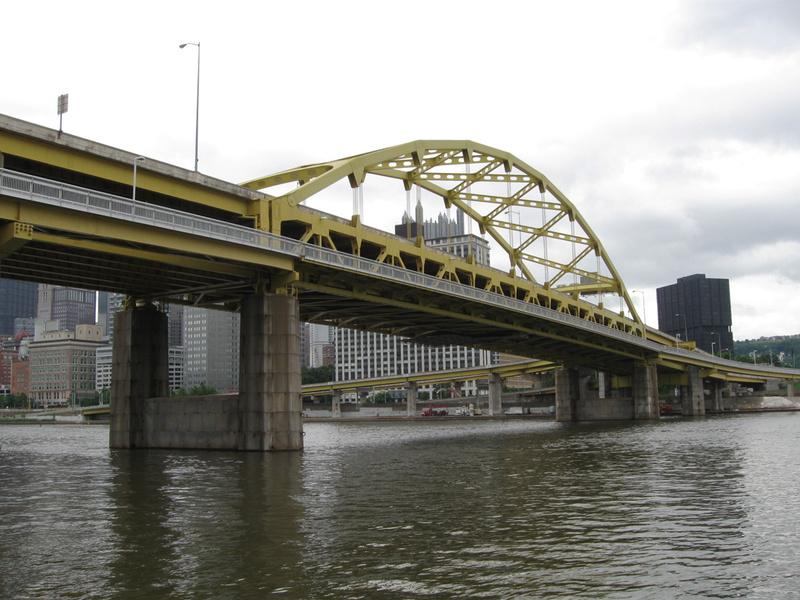 Prior to June 2009, Interstate 279 extended west from Downtown Pittsburgh onto Parkway West via the Fort Pitt Bridge to Interstate 79 near Carnegie. This route traveled through the vicinity of Crafton and Green Tree and under Mount Washington via the Fort Pitt Tunnel. It was replaced by a northwest extension of Interstate 376, following an interim period of cosignage along Parkway West. Painted Aztec Gold like the nearby Fort Pitt Bridge, the Fort Duquesne Bridge (I-279) spans the Allegheny River in this scene looking south from the Three Rivers Heritage Trail along the north banks of the river. Photo taken June 13, 2010. Interstate 279 provides metropolitan access from Interstate 79 into Pittsburgh. The Parkway West segment, which is now designated as Interstate 376 and U.S. 22-30, is much older than the Parkway North section of I-279. Parkway North was constructed in the mid to late 1980s while the Parkway West was constructed in the 1950s. The Fort Pitt Bridge opened in 1959 and the Fort Pitt Tunnel opened in 1960. Both elements were incorporated into the Interstate system in the 1960s.1 A road trip through the area in June 1989 revealed ghost ramps at the then future northern terminus. Starting in 1993, various portions of Interstate 279, including the Fort Pitt Bridge and Tunnel, closed for major road work as part of a long term rehabilitation project along Parkway West.2 The $200 million project culminated with the October 1, 2003 opening of the two-lane, 2,500 foot long ramp taking inbound Parkway West traffic to the outbound Parkway East over Monongahela Wharf. The final two year $84.2 million project opened two weeks ahead of schedule. Additionally the Stanwix Street off-ramp on Interstate 376 east opened to traffic in conjunction with the Fort Pitt Bridge ramp opening.3 The multi-year project included improvements to the Fort Pitt Tunnel, Fort Pitt Bridge, and other associated ramps of the freeway. 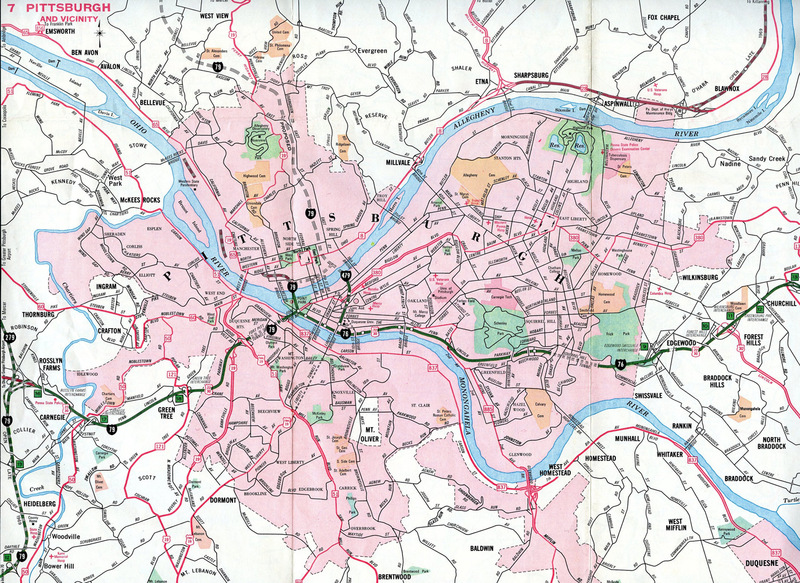 Pittsburgh – 1968 Pennsylvania Official Highway Map. Prior to 1970, Interstate 279 was proposed as the bypass for through traffic along Interstate 79 between Washington and Erie, Pennsylvania. I-79 was relocated to the west as the suburban route was completed much sooner than the Parkway North section. Renumber Parkway West as a westward extension of Interstate 76 (the Pennsylvania Turnpike mainline northwest from Monroeville was still a part of Interstate 80S). Interstate 279 was extended westward over Parkway West the following year as approved by AASHTO on December 3. I-279 overtook I-76 west from the Fort Pitt Bridge to I-79, as I-76 was reassigned to the remainder of the PA Turnpike northwest to Ohio and Parkway East renumbered as new Interstate 376. This configuration remained in place until 2009, when I-376 was extended over Parkway West as part of its 70-mile extension to I-80 near the borough of Wheatland. An end Interstate 279 shield assembly stands along side the northbound transition ramp to Interstate 79 north. This sign was replaced by 2010. Photo taken by Patrick Lilja (2006). I-79 advances north six miles from the wye interchange with I-279 to the Cranberry Connector with the Pennsylvania Turnpike (I-76). Photo taken 09/30/10. Interstate 79 splits with Interstate 279 two miles south of the diamond interchange (Exit 73) with Pennsylvania 910 in the borough of Franklin Park. Photo taken 06/11/10. The three lanes of I-79 south separate with two lanes for both I-279 south through the North Hills to Pittsburgh and the mainline south to Pittsburgh International Airport (PIT) and Carnegie. Photo taken 06/11/10. A second diagrammatic overhead precedes the wye interchange (Exit 72) with Interstate 279 on I-79 south. Photo taken 06/13/10. The left-hand exit for Interstate 279 south parts ways with I-79 south as the freeway turns west to the borough of Sewickley Hills. Interstate 279 serves commuters southward into the Steel City, with the reversible HOV roadway accompanying the route from U.S. 19 as it leaves the borough of West View. Photo taken 06/13/10. The first sign for Interstate 279 (Exit 70C) appears as U.S. 19 north merges onto I-376 & U.S. 22-30 (Parkway West) east from Banksville Road. Four lanes proceed east 0.2 miles to lane drops at both Exits 69B and 69C. Photo taken 06/11/10. Back to back ramps follow for U.S. 19 Truck & PA 51 (Saw Mill Road) south to the Pittsburgh neighborhoods of Beechview, Mount Washington and Beltzhoover, and the continuation of U.S. 19 north along side PA 51 to West End. Two through lanes for Interstate 376 & U.S. 22-30 advance east another 1.1 miles to the split with Interstate 279. Photo taken 06/11/10. Interstate 376 enters the Fort Pitt Tunnel through Mount Washington to the immediate east of Exit 69B (U.S. 19 & PA 51 north). Beyond the two lane tunnel, a left-hand ramp from PA 837 (Carson Street) expands the eastbound freeway to four lanes as motorists cross the Fort Pitt Bridge. A weaving traffic pattern ensues with the mainline separating into ramps for I-279 north and Downtown. Photo taken 06/11/10. Interstate 376 transitions to Penn Lincoln Parkway East via a two-lane ramp as Interstate 279 begins to the left via Exit 70C. I-279 partitions with a ramp for Fort Duquesne Boulevard before crossing the Fort Duquesne Bridge to the North Shore. Photo taken 06/11/10. Westbound travelers along Interstate 376 & U.S. 22-30 pass through a tunnel below ramps linking Grant Street and Fort Pitt Boulevard with Parkway East and the Smithfield Street Bridge on the half mile approach to Exit 70C with Interstate 279 north. Photo taken 06/12/10. Three lanes of Interstate 376 west continue below Wood Street as a left-hand ramp (Exit 70D) departs for Stanwix Street to the Golden Triangle. The right-hand lane departs for Interstate 279 and the Fort Duquesne Bridge next. Photo taken 06/13/10. Passing under Market Street, Interstate 376 & U.S. 22-30 separate into ramps for the Fort Pitt Bridge and Interstate 279 north (Exit 70C) to the North Shore in a tenth of a mile. Photo taken 06/12/10. A narrow two lane ramp elevates Interstate 376 & U.S. 22-30 west onto the Fort Pitt Bridge ahead of Mount Washington and Westwood while Exit 70C lowers to merge onto the left-hand side of I-279 as it passes through Point State Park. Photo taken 09/30/10. Interstate 279 (Parkway West) south lowered across Chartiers Creek on the one mile approach to then Exit 1A with Interstate 79. This set of signs was still in use as of 2015. Photo taken 10/31/04. Interstate 279 south & U.S. 22-30 west traveled through northern reaches of the borough of Carnegie just ahead of the Rosslyn Road off-ramp (Exit 1B). Signs here also remained in use for I-376 west in 2015, though with greenouts for Exits 64B/A. Photo taken 10/31/04. Traffic along I-279 south & U.S. 22-30 (Penn-Lincoln Parkway West) west entered a wye interchange (Exit 1B) for Rosslyn Farms just ahead of the ramps (Exit 1A) for Interstate 79 north to Erie and south to Washington. Sign changes made here by 2009 greened out U.S. 22 & 30 in favor of I-376 west for the freeway mainline to Moon Township and Pittsburgh International Airport (PIT). Photo taken 10/31/04. An end Interstate 279 shield assembly was posted just prior to the Interstate 79 exit. Photo taken 10/31/04. Motorists bound for I-79 departed in unison from the ending Interstate 279 at Exit 1A. Changes made here by 2013 expanded the I-376 mainline to three lanes. U.S. 22 continues west through Weirton, West Virginia, before entering Ohio, where it serves the cities of Steubenville and Cambridge. The Lincoln Highway (U.S. 30) travels west to Chester, West Virginia, then across the Ohio River to East Liverpool, Ohio. Photo taken 10/31/04. U.S. 22 & 30 (Penn Lincoln Parkway) east, one mile ahead of the southbound ramp for Interstate 79 and former transition to I-279 north. Prior to November 2008, there was no northbound access to I-79 from this direction. Photo taken 10/28/04. This scene looking one quarter mile ahead of the then unnumbered ramp for I-79 south to Washington changed during 2007-08 construction to both widen Penn Lincoln Parkway West and add the missing ramps between Interstates 79 and 279. Three eastbound lanes continue through here as part of the I-376 mainline now. Photo taken 10/31/04. U.S. 22 & 30 east at the former transition onto the northbound beginning of Interstate 279. This missing movement for I-79 north to Erie was previously accomplished via Pennsylvania 60 (Steubenville Pike) east through Robbinsville township. Photo taken 10/28/04. “Fort Pitt Bridge ramp to Parkway East opens on Oct. 1.” Pittsburgh Post-Gazette, September 17, 2003. “Fort Pitt ramp to Parkway East to open.” Pittsburgh Post-Gazette, October 1, 2003. “Lack of money delaying construction of missing Parkway West/I-79 ramps.” Pittsburgh Post-Gazette, September 17, 2003. 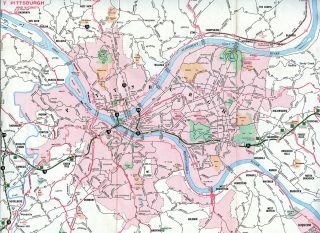 “‘Missing Links’ Take Shape at I-79/Parkway West – After 30 Years, PennDOT Poised to Open New Ramps and Widen the Parkway to Mitigate Rush Hour Traffic.” Pittsburgh Post-Gazette, August 2, 2008. Page updated August 16, 2016.